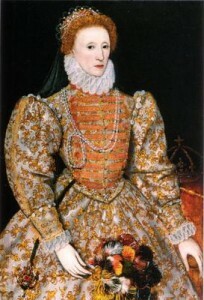 My favorite Tudor character (besides Anne Boleyn, of course) is without a doubt her daughter, Elizabeth I. Ever since I began reading about English history when I was very young, I have found Elizabeth to be an inspiration as well as a great role model, and even today, when faced with a difficult decision, I will sometimes ask myself “what would Elizabeth do?” I especially loved the 70’s TV series “Elizabeth R” with Glenda Jackson and have often thought that Elizabeth’s and my lives have a lot of similarities such as a love of reading, writing and politics, resembling our fathers, having a much older sister, and being the last of our family lines. Elizabeth beat some very long odds to become Queen of England. From the moment of her mother’s execution, which changed her own status virtually overnight from princess of England to daughter of executed traitor, she had to overcome great adversity to keep her own head attached to her body. That she did so proves that she was not only extraordinarily intelligent but also extremely wise for her years, a quality that begins early in life. She was likely never a child in the sense that we know them today; her formative years were mostly consumed with her educational pursuits, dealing with the various people whose homes in which she lived over the years, and disassociating herself from the more unsavory people who wished to use her for one reason or another. It was most fortunate for Elizabeth that she had some wise teachers and advisors helping her. She also had the love of the English people that would last her whole life. Her sister Mary surely realized this, and it is probably the reason for her refusing to sign Elizabeth’s death warrant. Elizabeth is also unique in English monarchs in that she chose to remain single rather than giving in to her counselors’ constant demands to marry. She knew from her sister Mary’s example that there was truly no satisfactory way she could have married, especially a foreign suitor, without relinquishing at least a part of her power as sovereign, and she wisely chose not to do so. However, her one human failing was that she was unable to completely keep emotion out of some of her decisions regarding her relationships with men, though that is a tall order for any woman. While she succeeded in keeping Thomas Seymour at arm’s length and wisely declined to marry Robert Dudley due to the scandal attached to his wife’s death, her attempts to guide and control the Earl of Essex failed, much to her dismay. The ordeal of his betrayal and execution affected her more deeply than she could have imagined, and surely helped hasten her own death two years later. It is difficult to say whether Elizabeth’s greatest triumph was establishing what would become the Church of England or her army’s defeat of the Spanish Armada. Suffice it to say that ANY monarch would be proud to claim even one such accomplishment, but Elizabeth counted these and so many more such as the emergence during her reign of such luminaries as William Shakespeare, Sir Francis Drake and Sir Walter Raleigh that it makes her unique among the many rulers who have come after her.